We at Intech are committed to on schedule error free delivery of automation products, that meet more than customers expectations at all times. Intech believes in continual improvement of quality management for an exciting future to all customers, associates and its employees. We believe in our philosophy of quality first in all aspects of our business. We are in this game for the long run and it does not pay to short change your customers for a quick buck. All activities at Intech are clear, transparent and is driven by SOPs and fixed procedures thus minimizing errors due to human intervention. Our commitment to quality and process is reflected in the fact that we were one of the first companies in the industry to get an ISO certification, way back in 2003. 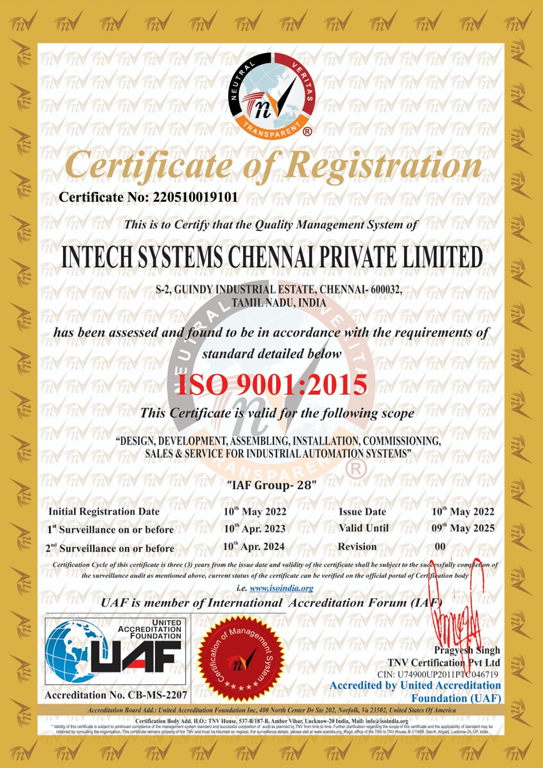 Intech is now a ISO 9001:2015 certified company for both distribution and project business divisions.